JAVELIN SPORTS CARS Ltd - - Car Reports, Event Reviews, Newsletters, Event and Show Dates. JAVELIN NEWS, CAR REVIEWS, EVENTS & SHOWS. Are you a car enthusiast ? This section will continue to grow as we put online more information for the serious car enthusiast. Including of course the latest Javelin news, car tests, show dates and event reports of interest. Look back frequently for information updates. Javelin are pleased to announce that the latest Mk3 Cabrio will be available for test drives after 13th June. Please phone to book. We will be attending the Bradford Classic 2007 with both the BMW based Javelin Mk3 Cabrio and the Sierra based Marlin car, so please come along and enjoy the show with us. For further information please contact Dave or Caroline Kitson on 01274-619608. Javelin will be exhibiting their new Mk3 Cabrio demonstrator - a fabulous BMW based sports tourer, at the National Kit Car Motor Show at Stoneleigh on the 6th to 7th May 2007. From 1st April 2007 a new prices will be in operation, which will mean increases will be applied across the board. Details of the new prices will be posted shortly. Anyone wishing to contain their budget and beat this increase would be wise to consider getting their order in as soon as possible. 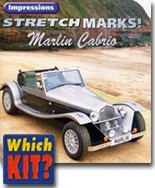 Javelin acquire the Marlin Cabrio Kit - 'Lock Stock and Barrel' on 12 July 2006. PRESS RELEASE from JAVELIN SPORTS CARS LTD.
Dave and Caroline Kitson who are active members of the Marlin Owners Club and proud owners of a V8 powered Cabrio, have acquired the complete Cabrio project from Marlin Cars and are trading as Javelin Sports Cars Ltd, based in Bradford West Yorkshire. The name has been inspired by the proximity of the site of Jowett Cars, who made the world renowned Javelin model back in the 1950's. Building on the success of the original Sierra based design and the Mk.2 lwb car, Javelin will be working closely with Marlin to develop the Mk.3 Cabrio using a BMW 3-series (E30 model) as the donor car. Using the straight six 2.5 litre engine as the standard power unit, the new sports car will be available in three options - kit, part built, or as a fully built turnkey model. Marlin directors Mark and Terry Matthews are sad to see the Cabrio go, but the sale will now allow them to concentrate on other models in their own range. They are confident in Javelin that it is going to a good home and as Marlin are to continue to supply the chassis and engineering know-how, customers can rest assured that the new Javelin Mk3 Cabrio will perform even better than the earlier cars. Existing Cabrio builders will continue to be serviced with parts and assistance through Marlin, but for those wishing to start building a Sierra based Mk2, or order the new Mk3 BMW based Cabrio sports car, these are now only available through Javelin. Look out for the new Mk3 Cabrio BMW appearing at shows later this year! To view reports click on the relevant publcation. We present below a few event reports from the archives that Cabrio and other specialist kit car owners have enjoyed over recent years. 'Life at the Front' - Ian White and Sarah Rich met everything first, as they landed car No1 for this beautiful and enduring seven day event. The last great motor endurance event of the 20th century. I was invited to be a navigator, for this arduous and extraordinary challenge. We are pleased to report, 'better every year', was the general opinion. Again using a varied route, the format has now proved to be successful! Class Winner and 'Best Built Car' in the Liege - Agidir - Liege 5,000 mile endurance Count Von Scharfenberg and his Marlin Sportster. Building on the success of last years event and run on the same format, we ventured on more minor roads and up some classic and famous hills. The first ever Marlin Cars Jurassic Classic Car Run. This ran from Teignmouth to Weymouth, via some challenging, interesting and historical routes. We are anticipating publishing more articles throughout the forthcoming year and hopefully these will cover a larger range of events, look back for details. 6th to 7th May 2007 National Kit Car Show Stoneleigh, Warwickshire.